I am very happy to present you this review writ­ten by Richard Kostelan­etz. 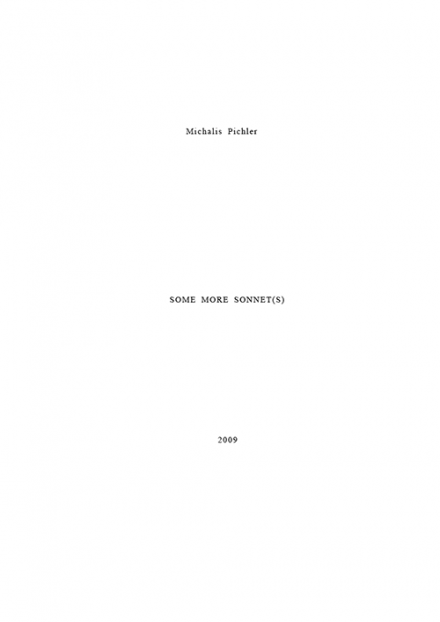 Michalis Pichler’s SOME MORE SONNET(S) was pub­lished by Greatest Hits, Ber­lin in 2011 in an edi­tion of 400 cop­ies. 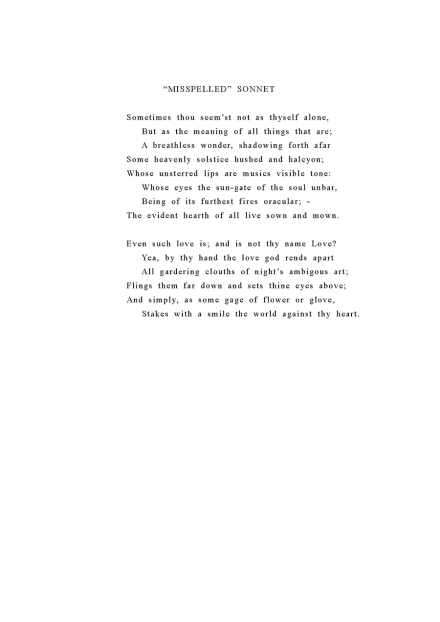 It col­lects 44 vari­ants of a son­net, that was ori­gin­ally writ­ten by Dante Gab­riel Ros­setti, and which was already pub­lished in 44 vari­ations by Ulises Car­rion in 1972. While Ulises Car­rion used a type­writer, Michalis Pichler used a com­puter, prob­ably word or open office. 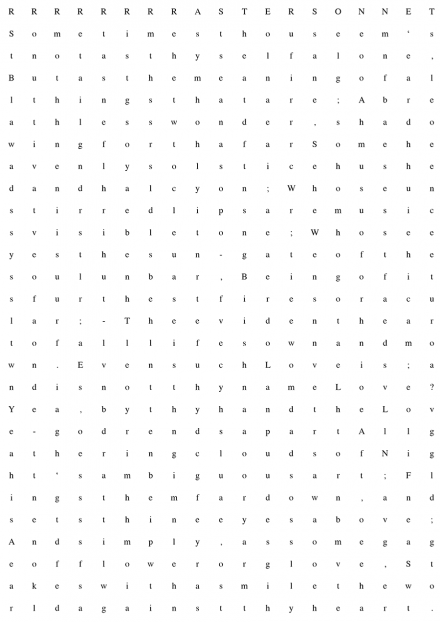 Michalis Pichler’s Times New Roman Son­net belongs in the rich tra­di­tion of nat­ive German-​​speakers who have writ­ten highly ori­ginal texts in Eng­lish. Both Dieter Rot and Ernst Jandl did some; Ros­marie Waldrop has pro­duced many. 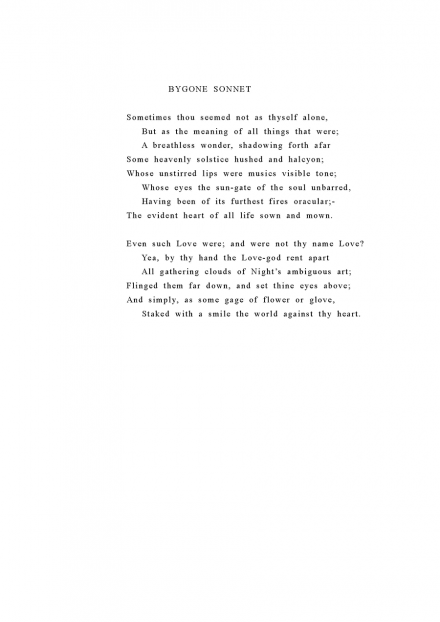 A Ber­liner of partly Greek ances­try, Michalis Pichler, has done here is taken a 14-​​line poem by Dante Gab­rel Ros­setti, changed its tense from present to past, and then sub­jec­ted his updated text to 44 visual/​verbal enhance­ments that are both indi­vidu­ally and gen­er­ally revelatory. which is per­haps only a writer not born to Eng­lish would risk. 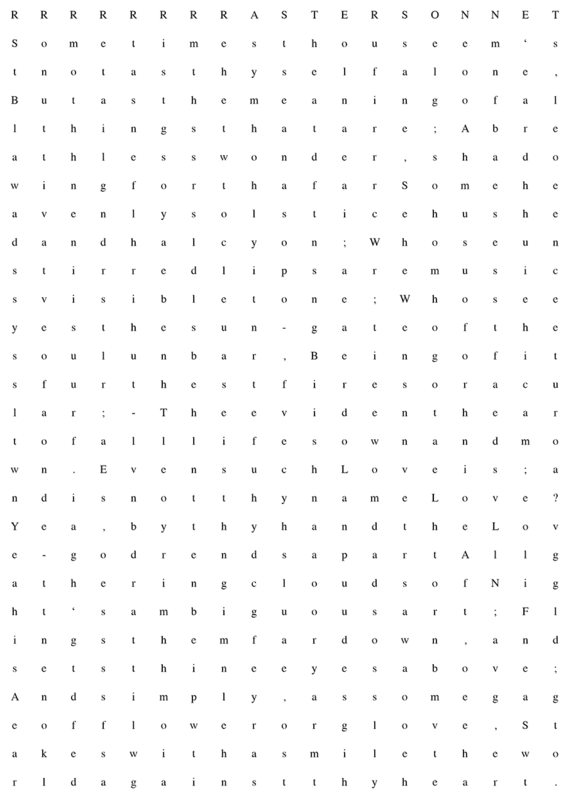 With words alone Pichler has made visual poetry that must be seen to be read, not pic­ture poetry recently advert­ised as “visual poetry” in Amer­ica or “con­cep­tual poetry,” whose char­ac­ter­istic device is fram­ing absence, which Pichler does only in the single oth­er­wise blank page titled “Miss­ing Son­net.” Col­lect­ively and indi­vidu­ally, his moves in Some More Son­nets are invent­ive and amusing. As aside, I recom­mend an earlier Pichler book, New York Garbage Flag Pro­file(2005), where he pho­to­graphed straight­for­wardly a large num­ber of NYCgarbage piles con­tain­ing an Amer­ican flag in some leg­ally desec­rated con­di­tion. For cap­tions he metic­u­lously doc­u­ments where he found each flag. In mak­ing art out of doc­u­ment­a­tion, this book reminded me of Jan Hendrikse’s clas­sic Broad­way (1983), where the Dutch artist then resid­ing in New York shot a black-​​white photo of ever inter­sec­tion in Manhattan’s longest street. What should be made of European artists doing what Amer­ic­ans let alone New York­ers, haven’t done with my home town? As a second aside, I should note that Pichler was inspired by earlier book art by Ulisés Car­rion (1941 – 2002), a Mex­ican resid­ing in Ams­ter­dam, who reworked the same Ros­setti text a few dec­ades ago. How­ever, whereas Car­rion in 1972had a type­writer, Pichler employed a com­puter with its avail­able pro­grams for super­ior enhance­ment. So his richly res­on­ant new book refers not only to Eng­lish lit­er­at­ure by a cer­tain earlier sig­ni­fic­ant move in inter­na­tional book-​​art. And whereas the Car­rion book is hard to find, Pichler’s can be pur­chased for 20€ from vari­ous Inter­net sites. For example here.